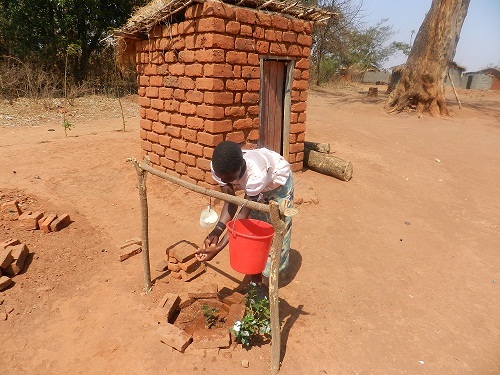 Eight African countries are creatively achieving the goals of community led total sanitation programmes (CLTS) including one idea in Malawi where handwashing is monitored according to the health of tree seedlings planted beneath water outlets. In Zambia several schools have established vegetable gardens to reduce malnutrition and improve school attendance. Some of the harvests have been sold raising funds for school activities. In Sierra Leone men have traditionally been the community leaders but women are now being encouraged to play a major part in village committees and networks of natural leaders. To support CLTS women conduct house-to-house monitoring, giving health talks and reporting diseases –- many of them overcoming challenges such as illiteracy to maintain the programme. Plan International’s five year Pan African CLTS (PAC) programme which ends in December, 2014, is operating in the eight countries of Sierra Leone, Ethiopia, Uganda, Kenya, Zambia and Malawi, Ghana and Niger. With the backing of the Dutch government the project was designed to promote and scale up sanitation in communities and schools. A mid-term programme review by Plan Netherlands, the Plan International Regional Office for Eastern and Southern Africa (RESA) and their programme partners which include the IRC International Water and Sanitation Centre (IRC) and the Institute of Development Studies, University of Sussex (IDS) shows that Ethiopia has made the most progress. One of its achievements is the introduction of local bylaws on sanitation. By the end of 2012 the country’s 103 kebeles (small neighbourhoods) with 117.024 households and one or more schools had safe sanitation and hygiene services and reached ODF status (no open defecation). With schools a focus of CLTS in Ethiopia ODF status schools need a water supply system to clean latrines and for washing hands. As there is no toilet subsidy or financial reward when the community reaches 100 % ODF, planning these systems for schools and communities helps communities and schools climb the sanitation and hygiene ladder. The Plan Ethiopia review found those involved in constructing sanitation facilities were women and children with in kind support from wealthy and poor households. The review noted that benefits for women included being able to avoid open defecation at night, avoiding security issues and easier care of children. Costs were lower than anticipated for the Ethiopia project, with the total cost per person in an ODF community at less than $US 1 and total cost a new household latrine at $US 3 – compared to usual programme costs of $US 5-15 per household. In Uganda local governments and communities monitor CTLS so district health inspectors can share the data with ministries and national government. Plan helps develop local staff who in turn train community groups. The Uganda report found that women were important natural leaders and that few CLTS processes or constraints were gender related – most were generic, technical or institutional problems. 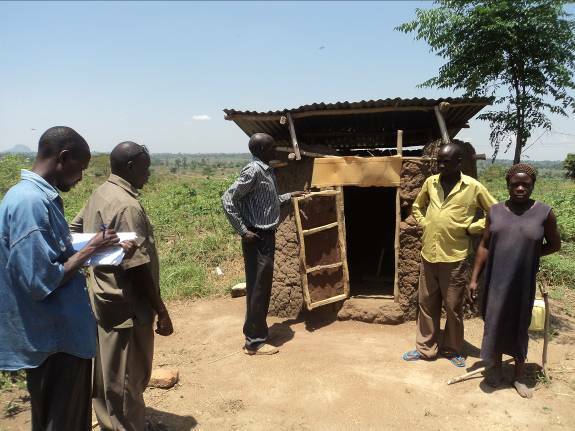 In Kenya chiefs, assistant chiefs and community health workers were trained to encourage communities to become ODF. This resulted in locations being selected for toilets in many communities. In another example leaders asked the City Council of Nairobi to remove a dump site from their community. Many women in Zambian villages are members of a sanitation action group. They have highlighted how inadequate sanitation causes diarrhoea and that using a toilet is much healthier, hoping their successful efforts will motivate neighbouring villages to be as vigilant. Malawi had the strongest engagement with local government. Natural community leaders spotlighted activities to attain ODF status. Leaders reported bi-monthly on progress on such issues as the use of handwashing facilities, and the availability of drop-hole covers in latrines. Leaders’ networks have helped in information exchanges especially between successful ODF villages and those who struggle to attain the ODF status. The leaders also conduct meetings on faecal oral transmission. Many villages have adopted effective sanitation and hygiene practices because of their efforts. To ensure cross checking of correct data the leaders alternate their monitoring in different villages. The network meetings are not funded apart from those organised by the district coordinating team. Successful villages can start Village Savings & Loans activities which increases their status in adequate sanitation. Plan Malawi has had a marked increase in villages attaining ODF (7 from 2010-2011 to 63 villages between 2011 and 2012). To guarantee that handwashing facilities are not just being erected ceremoniously but effectively used, members of the village devised an innovative idea of planting a seedling of a tree under the facility. Niger enjoyed growing local support for CLTS. It built adobe (clay) desks in schools, repaired boreholes following long-term malfunction and transformed old defecation sites into vegetable gardens. Tannin seeds were used to strengthen earthen latrine construction and a tobacco solution used to protect latrine timbers against termites. The Niger report also highlighted the concerns of some stakeholders that sustainable sanitation improvement will not be possible without hardware subsidies. The country had also experienced severe flooding which destroyed newly constructed latrines. Food shortages are another problem which is hampering progress on CLTS in the country. Read more about Pan-Africa Programme on the websites of IRC and IDS – Community-Led Total Sanitation. “Natural leaders energising change in villages to attain and sustain open defecation free status“. This entry was posted in Africa, Dignity and Social Development, Hygiene Promotion, Sanitary Facilities and tagged changing behaviour, Community-Led Total Sanitation, Ethiopia, Institute of Development Studies, IRC International Water and Sanitation Centre, irc's approach, Kenya, Malawi, Niger, open defecation-free villages, Plan International, schools, Sierra Leone, Uganda, Zambia. Bookmark the permalink.